Igloo Style Heated Pet Mats feature the same rugged construction as the standard Pet Mats, but are molded into a convenient shape to fit the popular 'igloo-style' dog houses. UL-recognized components are combined with a built-in thermostat, a tough, easy-care washable exterior and a unique airspace to provide a safe, radiant heat that will match your pet's body temperature range (102 degrees maximum temperature). Your pet will appreciate this, as products designed for humans can get too hot and cause blistering and hair loss in animals. The UL-Approved cord is steel spring wrapped to help prevent chewing. Ultra-Soft Faux Lambskin Covers are available for your Heated Pad and still allow its heat to radiate properly. It is important to avoid covering with dense blanket-like materials that hold in the heat, as it may damage the internal thermostat. The covers are machine washable. LectroKennel Products are covered by our 30 day money back guarantee, as well as a 1 year warranty from K & H Manufacturing. An internal thermostat keeps the temperature at a desirable 102° when in use. 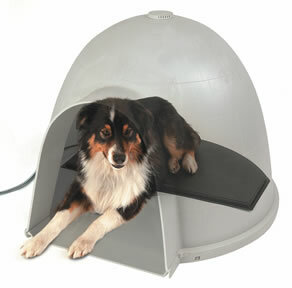 An optional Temperature Control Unit is available to lower the warmth of your LectroKennel pad. Recommended whenever Lectro-Kennel pads are used for whelping, puppies, elderly or recovering pets.